The Wildlife Leadership Academy enriches Pennsylvania teens and empowers them to become certified Conservation Ambassadors through attending one of our 5-day residential summer field schools: white-tailed deer, brook trout, ruffed grouse, turkey, or bass. 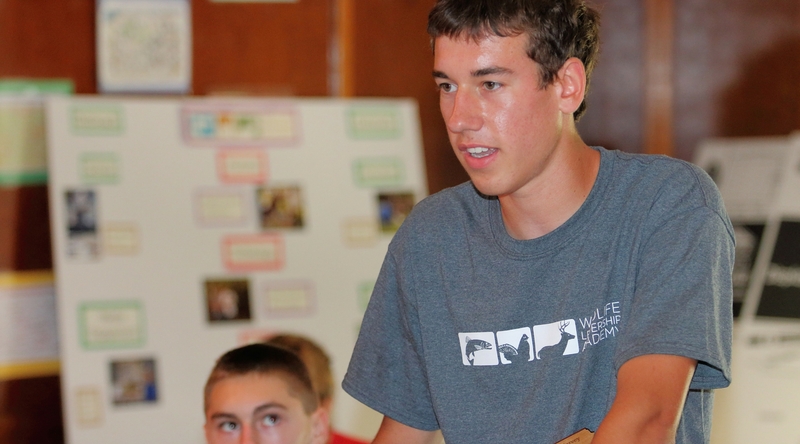 Our students gain extensive knowledge about wildlife and conservation, leadership experience, and communication skills. Please consider helping us continue to build a network of inspired and dedicated young leaders for conservation to ensure a sustained wildlife legacy for future generations. Certificates designating them as Conservation Ambassadors. Join an Academy Alumni Network of wildlife, fisheries, and conservation professionals. We are looking for highly motivated students between the ages of 14 and 17 to join one of our 5-day residential summer wildlife/fisheries focused field schools to begin their journey to become Conservation Ambassadors. Students should have demonstrated interest in the outdoors and in wildlife and/or fisheries conservation. Our nomination process is now closed for the 2019 field school season. Because of caring and engaged mentors like you we received a record number of nominations again this year – THANK YOU! If you would still like to encourage a youth to apply this year you can send them directly to our application page HERE. The application deadline is March 15, 2019. What is the cost of tuition for the Wildlife Leadership Academy? Tuition Cost is $500 which includes housing and meals. Scholarship support is available; applicants will receive a scholarship application during the application process. Students are also encouraged to connect with their communities to find tuition support. When will my nominee hear from the Academy? Invitation to apply packets will be mailed the first week of January to students who are nominated prior to this date. Students nominated after January 1st will be mailed a packet within two weeks of receiving their nomination. Can a 13 year old or 18 year old apply? Our preference is for ages 14-17. However, for 13 year old applicants, if they are competitive and mature, they may be selected to attend field school. We rarely select 18 year old applicants/graduating seniors, as program expectations are that youth complete community outreach after the field school and most 18 year olds (high school seniors) are likely off to college. Yes, the field school is 5 days/4 nights. However, the Wildlife Leadership Academy is not just a one week program, accepted students are mentored to engage in conservation focused community outreach after the field school. In addition, we aim to support the success of our alumni from high school to college to career. What are the dates for 2019 field schools? Note: when applying students will be able to denote their field school of interest by rank. Click here to view 2019 Wildlife Leadership Academy Dates and Locations.